Whatever your views on whether horses should or should not be ridden, look beyond those beliefs to the relationship portrayed in this film by Ella Kiviniemi. Notice the balance of desires (man vs horse) and how they trade back-and-forth for ‘who’s in charge’. This horse seems much happier to me than dozens of non-ridden horses I’ve seen. Horses confined to paddocks, or a few acres. Horses whose work is with non-riding humans in round pens or arenas. This horse’s life is far closer to the needs of a natural horse; to range, explore, have adventures. Audelina loves trekking on quieter roads or trails – but not too far from her baby Juno yet! Horses are endlessly curious, and playful, and like to stop to sample different plants and grasses – remember how much soil affects the taste of plants! Horses kept in the same pasture day after day have a limited palate. 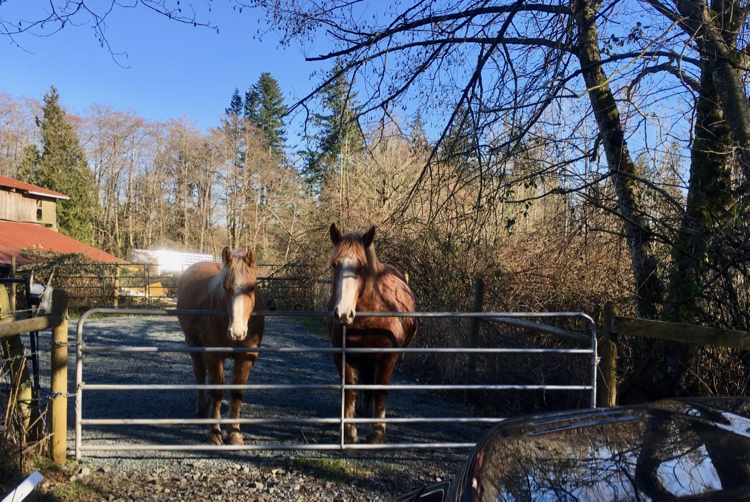 So if you believe horses should never be ridden, under any circumstances, then I hope you take your horse out for hikes – as this video illustrates – wherever you can, and wherever your horse loves to go! And if you only ride your horse in the same arena, day after day, I hope you take your horse out for foraging or adventures! If your horse shows too much anxiety or pep, then don’t ride! Hike beside your horse. It will be a fabulous experience for both of you. If there’s literally nowhere to ride or hike near you, then rent a trailer for the day. Once a week, or even once a month, would change your horse’s life and increase the enjoyment in your relationship tenfold. Too often, we focus on the immediate physical needs of our horses; food, supplements, feet, teeth, grooming. And we disregard their intense enjoyment of play, adventure, ranging and foraging. With the non-stop rain and cold we’ve been having, I too have been falling down in this department. Or spending too much time on chores and projects (the urgent vs. the important) and not enough time taking them out – even though they stand at the gate pleading. Well, the power is in the present; in today. So even if I can only take 1 out a time, I will put my full rain gear on and start today! Please please take us OUT. It will be FUN I promise! What a lovely relationship between this man and his mare. 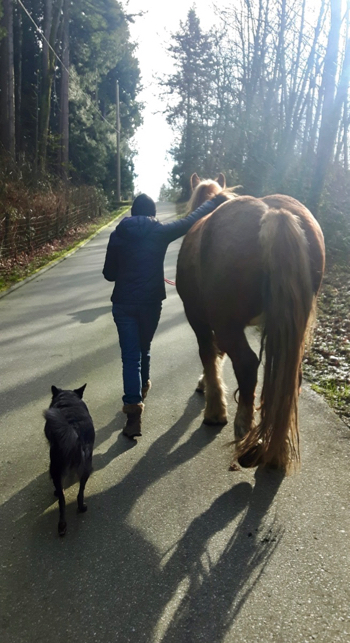 I love to ride and walk with my horses and agree wholeheartedly with their need to explore new places, taste new grasses and walk, trot and gallop over varying terrain. Thank you for sharing the video. My heart is still smiling and I look forward to the next adventure with my beauties. Yes, I love their obvious enjoyment and how they truly share each experience. How absolutely wonderful! What a delight!